This is a post I wish I had never been inspired to write. It is about some things that make my garden a mess and my attitude not so nice. Today as I pulled some of the storm damaged plants, I was greeted by some of the following....and I can say I was NOT excited to see any of them! Recognize this little fella? Of course we all do! 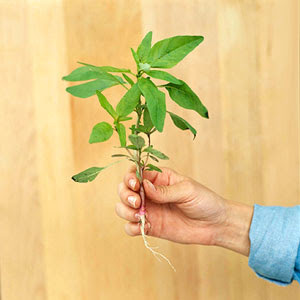 Appearance: Strong taproot; leaves are deeply notched. Yellow flowers mature to puffballs. Control: Mulch to prevent it in gardens; pull plants by hand or use a post-emergence herbicide in lawns. Make sure you take the entire root! 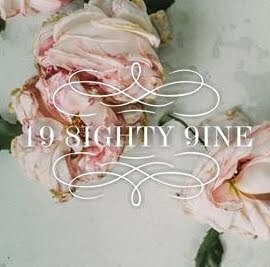 Leave anything behind and you are certain to have a re-run of this baby! Appearance: Broad, flat leaves around a low rosette. Note: Each plant can produce more than 15,000 seeds. Kind of pretty isn't it? Do NOT be deceived....this is a very bad and invasive weed.. 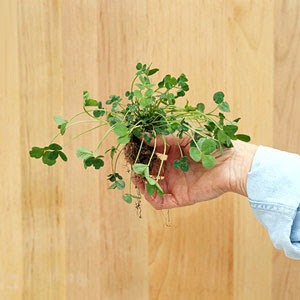 Appearance: Clover-type leaves and small, yellow flowers. Control: Mulch to prevent it in gardens; pull plants by hand or use a post-emergence herbicide. Discourage it by keeping soil well watered and amended with organic matter (such as compost). Appearance: Wheatlike flower spikes appear above slender clumps of grassy foliage. Appearance: Arrowhead-shape leaves on twining vines; bears white to pale pink morning glory-type flowers. Control: Mulch to prevent; repeatedly chop down growing plants and/or treat with post-emergence herbicide. 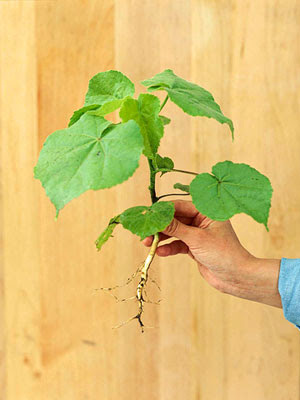 Note: Wandering roots produce offspring 20-30 feet from the mother vine. Will wrap itself around pretty much anything...and the roots are hard to rid! Appearance: Produces large, wavy-edged leaves and large seed heads covered with brown seeds. Control: Mulch to prevent it; pull and dig up plants or treat with a post-emergence herbicide. 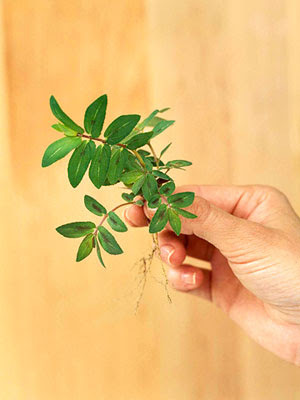 Note: Each plant can produce up to 40,000 seeds that wait decades before sprouting. Appearance: Low, creeping plant with scallop-edge leaves and purple flowers. 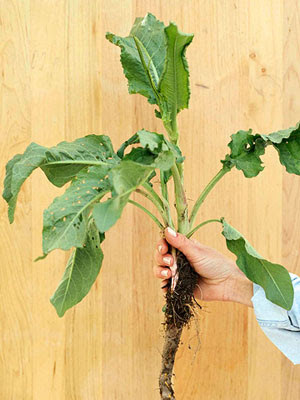 Control: Mulch to prevent it in gardens or use pre-emergence herbicide in spring; pull plants by hand or treat in lawns with a broad-leaf, post-emergence herbicide. Appearance: Slender leaves, borne on an upright stem that branches. It produces puffy white to pale lavender daisies. Control: Mulch to prevent it or use a pre-emergence herbicide in spring; pull plants by hand or spot-treat with a post-emergence herbicide. This one gave me a trip to the doctor a few years back! Do NOT pull this one without gloves....let me tell you! Appearance: Sawtooth-edged leaves and yellowish flower clusters are covered with stinging hairs. Control: Mulch to prevent it; dig out plants or treat with a post-emergence herbicide. Note: Always wear gloves when working around this plant. Oh yes...gloves...this plant leaves little hairs in your skin that will cause redness, swelling and lots and LOTS of pain. Appearance: Green or purple-blushed leaves form dense mats. Control: Mulch to prevent it in gardens or use a pre-emergence herbicide in lawns; pull plants when young or spot-treat with a post-emergence herbicide. Sounds like a medical condition doesn't it? nothing with a name like that can be good...Nothing. And now for my biggest enemy in the garden this year....It needs no introduction....none at all.. Appearance: Lush green mats studded with small, star-shape flowers. Control: Mulch to prevent it in gardens or use a pre-emergence herbicide in early spring; pull plants by hand. One lady on my street thought this was a good perennial...and nursed them to maturity! Where it grows: Landscape or garden areas with rich soil in sun or shade; Zones 3-10. 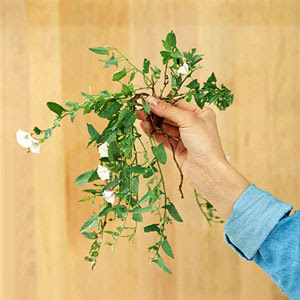 Appearance: Bushy or climbing plant with white or purple flowers and purple or red fruits. Control: Mulch to prevent it in gardens; pull by hand or treat with a post-emergence herbicide. Note: All parts of this plant, including the fruits, are poisonous. Yes...she is not too intelligent. Who hasn't seen this one? 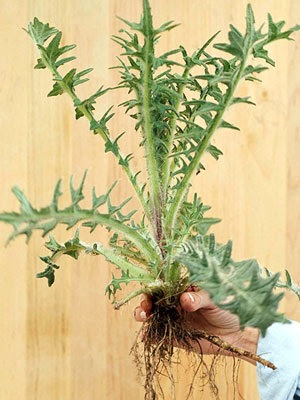 Appearance: Prickly leaves off of tall stems topped by heavy 2-inch purple flowers. Control: Mulch to prevent it; use a post-emergence herbicide or dig it out. Get the whole root....and USE YOUR GLOVES! Remember this one from the allergy medications commercials? 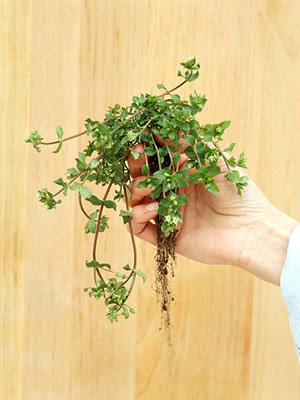 Appearance: Finely cut green leaves are almost ferny. Control: Mulch to prevent it; use a post-emergence herbicide or pull it out by hand. Another one of my neighbors lawn babies! 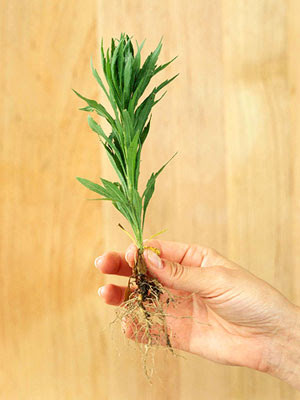 Appearance: Grassy plant; grows roots anywhere the stem makes soil contact; seed heads spread out like four fingers. Control: Mulch to prevent it or use a pre-emergence herbicide in lawns; pull plants by hand or spot-treat with a nonselective post-emergence herbicide. And it will! trust me! I don't care what anyone says....clover is NOT lucky! Appearance: Three-lobe leaves frame round white flower clusters. 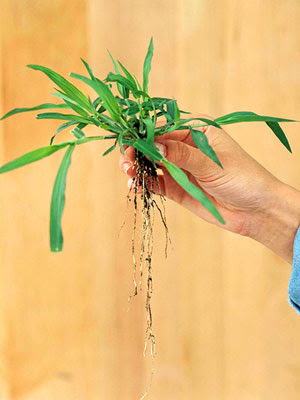 Control: Mulch to prevent it in landscape areas; use a post-emergence herbicide in lawns or hand pull. Helpful or not....I can get nitrogen from a can....it has got to go! Have you ever tried to pull it? you need muscles! 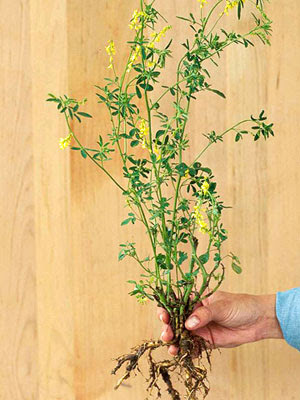 Appearance: Lanky branches; clover-like leaves; fragrant yellow flowers. Control: Mulch to prevent it; pull plants by hand or spot treat a post-emergence herbicide. 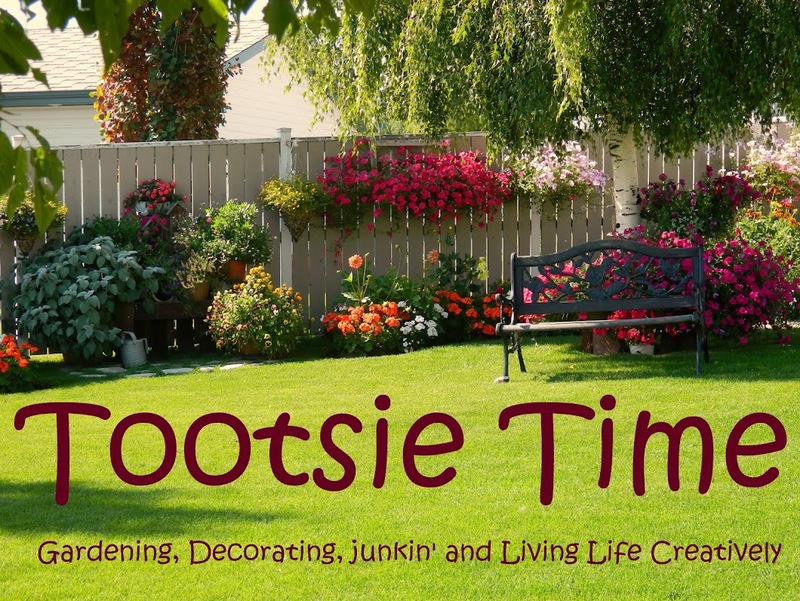 Not Sweet as far as this Tootsie says! Appearance: Large, velvety heart-shape leaves up to 10 inches across; yellow flowers in summer. Control: Mulch to prevent it or use a pre-emergence herbicide in spring; pull plants by hand or use a post-emergence herbicide. Appearance: Tall plants with a taproot; hairy-looking clusters of green flowers. Control: Mulch garden areas in spring to prevent it or use a pre-emergence herbicide in spring; pull plants by hand or spray with a post-emergence herbicide. This one is easy to pull....but hard to get rid of. 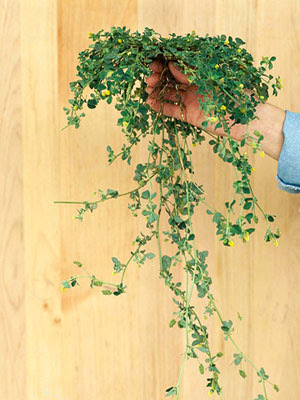 Who would have thought a houseplant would make it to the weed list! Appearance: Ground cover with scalloped leaves and clusters of purple flowers in late spring. Control: Mulch garden areas in spring to prevent it; pull plants by hand or spray with a post-emergence herbicide in spring or fall. Keep it indoors or it will become a least favorite! I have hardly begun! The list of invasive weeds is seemingly endless...I have only touched on some of the most common ones!!! 1. Be a mulching maniac. Mulch acts as a suffocating blanket by preventing light from reaching weed seeds. At the same time, it holds moisture for your plants and provides nutrients for your soil as it decomposes. Apply coarse mulch, such as bark or wood chips, directly onto soil. Leaves, grass clippings, or straw work better as a weed deterrent with a separating layer of newspaper, cardboard, or fabric between them and the soil. I am not a mulcher...maybe I should be. My neighbor is a mulcher...a mulcher with a lot of weeds mixed in...so I am not convinced that this works.. This is true...but if you are going to water....wear rubber garden gloves! 3. Cut weeds down in their prime. Weeds love open soil. But if you till or cultivate, then wait to plant, you can outmaneuver the weeds. Till the ground at least twice before you plant. 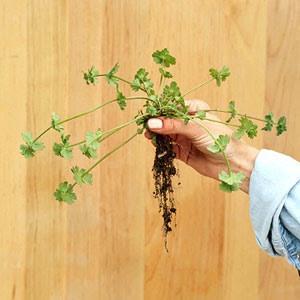 Your first digging will bring dormant weed seeds to the surface where they can germinate. 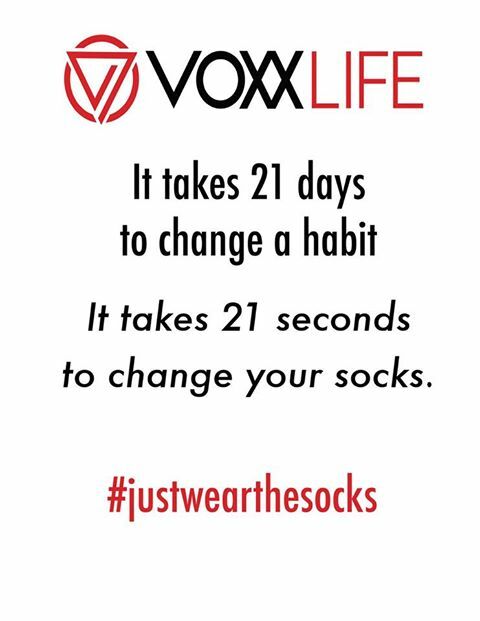 Watch and wait for a few weeks until they begin to grow. Then slice up the weeds again with a tiller or a hoe, only don't dig as deep. Now it should be safe to put precious plants into the soil. I do this faithfully each year..but sadly the weeds keep coming...I suppose that if you do it and your neighbors don't you are doomed! Doomed I say! Try sweeping rock salt into crevices between paths. Although more harsh, borax also works well. Be sure to wear rubber gloves with the latter material. You might need to apply a few doses, but be aware of any surrounding plants because both products kill the good plants along with the bad. 5. Lay down the law. Try using landscape fabric as a weed controller. Landscape fabric is usually made of a nonwoven, porous polypropylene fabric, which enables air, water, and nutrients to reach the soil but keeps weed seeds in a dark, cool environment where they can't germinate. You lay down the fabric, cut a hole where your plants are positioned or will be planted, then cover the fabric with a 2- to 4-inch layer of mulch or gravel. However, landscape fabric doesn't work well on steep slopes or windy sites, where the mulch often slides off or is blown away, exposing the fabric. 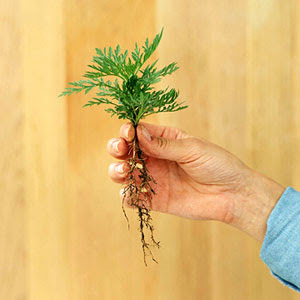 Never use plastic, as it prevents moisture and air from reaching your plants' roots. If you have pesky weeds in a spot with no nearby grass or valuable plants, boil water and pour it over the unsuspecting weeds. To control the stream of boiling water and to save surrounding plants and your toes from a scalding, use a teakettle. 7. To compost or not to compost. After you've labored to rid your garden of weeds, be careful that you don't throw weeds onto the compost heap where they can drop seed and infect your entire yard. 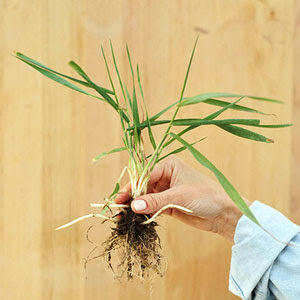 When you pull or till young weeds, leave them where you chop them and let the sun dry them out, then use them as mulch. Throw mature weeds on a hot compost pile where they should cook at 200 degrees or higher for several weeks to ensure the seeds are killed. This is good advice...and be careful where you buy your compost....some places don't screen for weeds! Cultivate plants close together or grow winter groundcover in areas that typically suffer from weed invasion. A thick mass of plants not only is attractive but also shelters the soil from direct sunlight, making it more difficult for weed seeds to prosper. I plant as thick as thieves....and I still had weeds...but not as many as I could have had if I didn't! 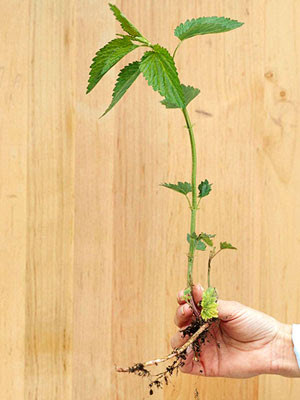 Weed every couple of weeks throughout the growing season in order to stay in control of the weed situation. If you're going to get down and dirty, use a comfortable knee cushion or try pads to lessen the impact of weeding on your body. You can also try an upright tool such as the Weed Hound, which prevents excessive bending or body strain. It is also great exercise! If you can identify the sprouting menaces in your yard, you can control their reseeding habits better. 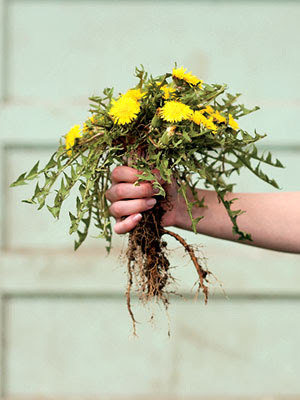 Annual weeds complete their growing cycle from seed to plant in a few months, then die. Unfortunately, they can leave behind thousands of babies if they go to seed, so always try to remove annuals before they drop seeds. Perennial weeds usually live for at least three years and are more difficult to banish, so at first sighting remove them immediately. 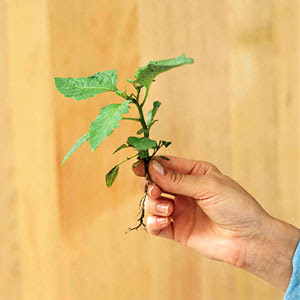 If the weeds are starting to grow, but you don't have the time or energy to pull them up at the moment, suffocate the weeds by covering them with a block of wood or piece of plastic. Better yet, use a few large decorative stones, a work of art, or a birdbath. At least you'll stop the weeds from spreading so you can tackle them when you have time. Never even thought of this! 12. Off with their heads. 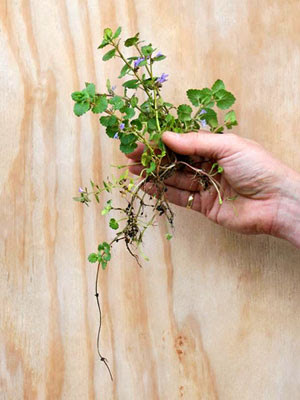 To stop weeds from spreading, pluck off their flower heads before they drop seed. 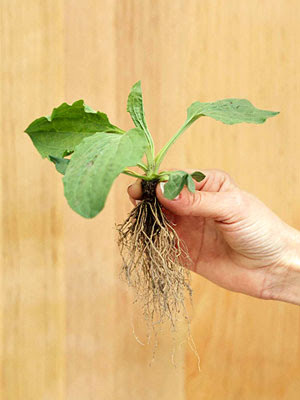 This technique can be especially helpful with annual weeds, which love to provide generation after generation of weeds. 13. Don't go too low. To help discourage weed germination in your lawn, avoid scalping with your mower. A buzzed lawn not only kills the grass in that spot, it allows light to reach the weed seeds and gives them the opportunity to sprout and run amok. Raising your mower blade also helps promote extra root growth in your lawn, making it harder for weeds to get a foothold. Fertilizing your grass a few times each year is also a great way to help the lawn choke the weeds out! I also found a website....which will not be named...that actually SELLS the seeds to these horrible plants!!!!!! Yes I was stunned too....the worst part....they are more expensive than seeds for some of the most beautiful plants I have ever seen! It got me thinking....how much money you and I are throwing away every time we rid ourselves of these pests! I could be a millionaire off the chickweed issues alone! *)*)*) to my special three...if there's one thing I have learned from YOU...it is that sometimes the greatest disappointments in life turn out to be the biggest blessings!!! 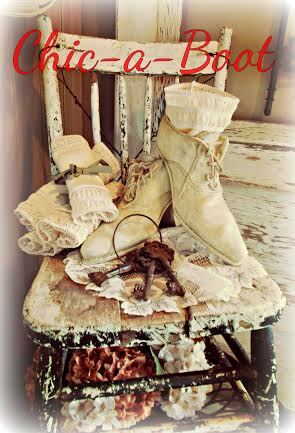 ***the photos for today's post are not my own...they are borrowed from the internet. This post originally was published in 2008...but I felt it was worth re-vising and sharing again!